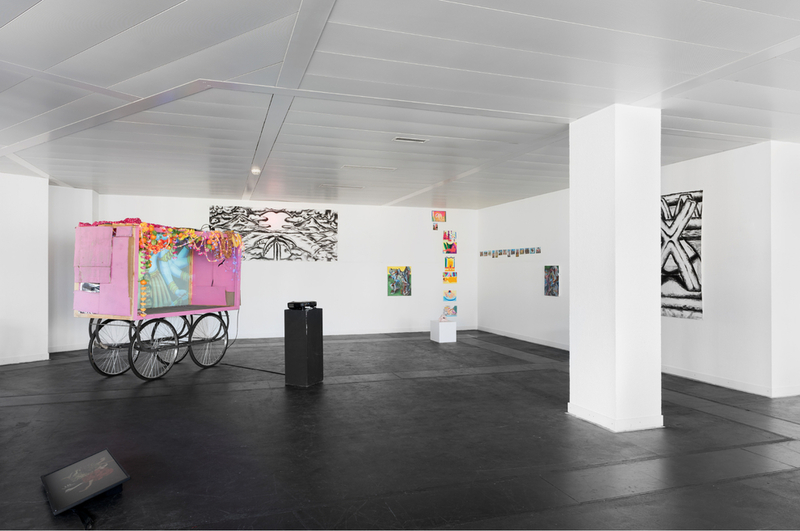 The artists opened their studio together with König Büro to a broader public and showed what they have been creating for the past years. The show, which was developed together, did not present single, clearly defined artistic positions but showed unique, unexpected compositions and arrangements of the artworks. This was accomplished because the artists and the curator engaged together and new encounters were made possible. The achieved connections were versatile and manifested on multiple levels in terms of content and formality. The intuitive process of work and the use of color as the most important means of expression was the artist's common denominator. 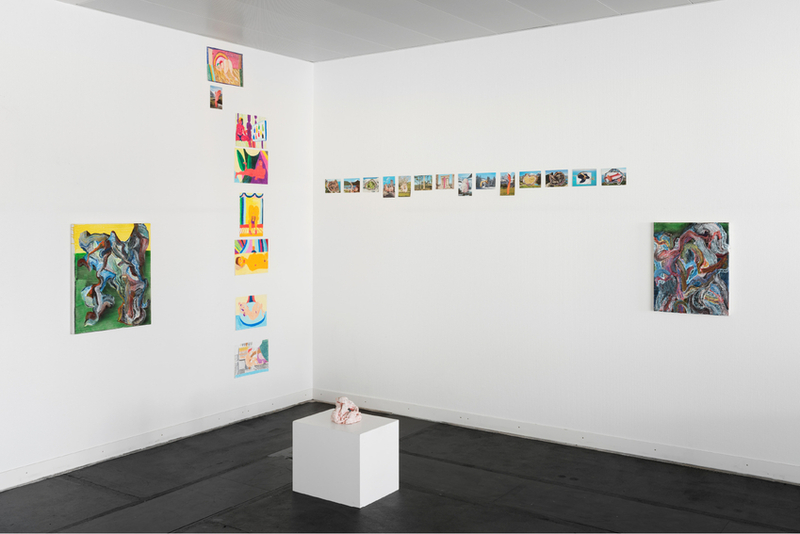 Connections between the various works were made visible through an experimental, process-like approach for the consolidation of the works to a group exhibition. In this framework the König Büro acted as a mediator between art and public. 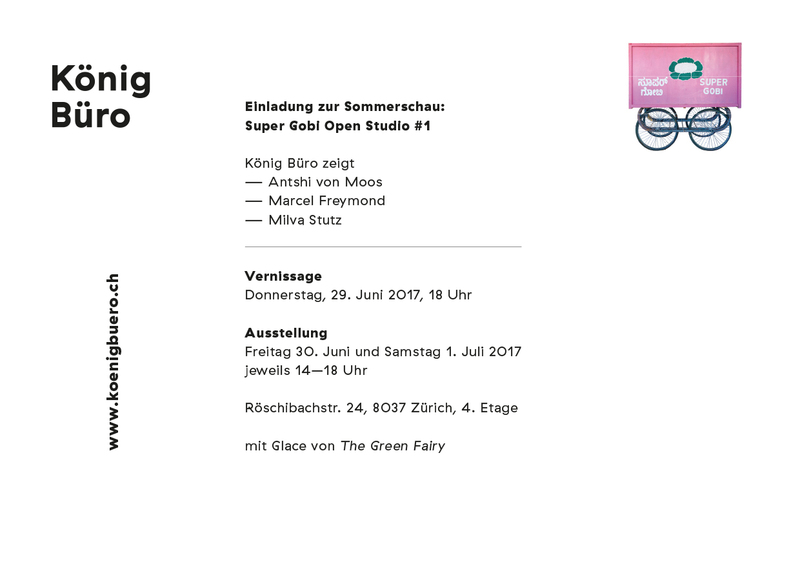 Exhibition view "Super Gobi Open Studio #1" at the studio collective, Zurich, Switzerland, 2017. With works by Antshi Von Moos, Milva Stutz and Marcel Freymond. Photo: Stefan Jäggi. Detailed exhibition view "Super Gobi Open Studio #1" at the studio collective, Zurich, Switzerland, 2017. With works by Antshi Von Moos, Milva Stutz and Marcel Freymond. Photo: Stefan Jäggi. 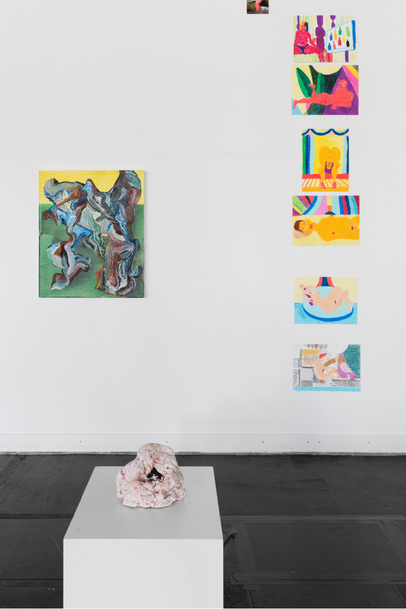 Left: Antshi Von Moos "5500 Year Old Garbage", 2014. 5500 year-old wood, chewing gum and saliva, 71 x 11 x 9 cm. © The artist. Right: Milva Stutz "Bay of Plenty", 2017. Charcoal on paper, 150 x 100 cm. © The artist. Photo: Stefan Jäggi. 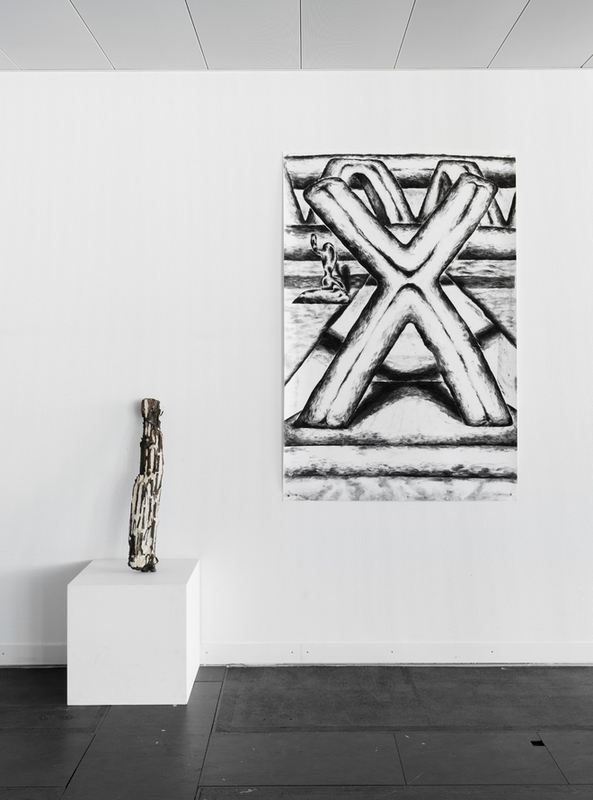 Left: Marcel Freymond "L'Ange du Foyer", 2016. Oil on canvas, 80 x 60 cm. © The artist. Right: Milva Stutz Serie "Nur nicht aus Liebe weinen", 2017. Oil chalk on paper. © The artist. Below: Antshi Von Moos "Shiva's Eye", 2014. Screen, chewing gum and saliva, Loop 2:35 min, 17 x 13 x 9 cm. © The artist. Photo: Stefan Jäggi.